The Golden Rathian is the rarest and most powerful sub-species of normal Rathian. This subspecies differs mainly by its glossy golden scales of the ordinary relatives. Its shell is extremely hard, especially in the head, resulting in a high degree of sharpness is required to come to pass. 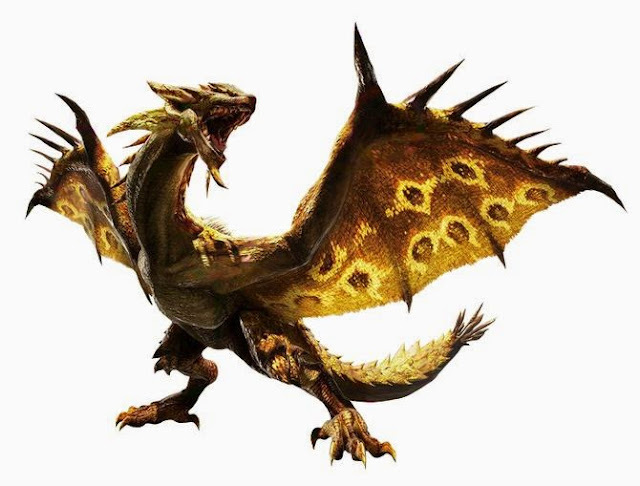 The Golden Rathian is the counterpart to the silver Rathalos and together they form the pinnacle of Flying Wyvern. Most effective against this monster is water -element weapon, which is why you should take this. Elements use are, as already known, the fire element. In addition, as already enforce the previous versions, use poison. Destructible body parts at the golden Rathian are her head, the two wings, the tail and the back. The tail can be separated with bladed weapons. In combat, the golden Rathian behaves not unlike the pink Rathian, however get a few new movement patterns to. The fight is further complicated by the fact that the monster is a lot stronger and more life than the previous Rathian. You will fight the monster only in the Spire, which consists of an area which does not escape you or the monster can. Like the normal Rathian, the golden subspecies is constantly running on you or shoot fireballs to you. The attack with fireballs something has changed in the golden Rathian. She shoots while on the floor is always three fireballs to you and goes after every shot fireball take a step back. A still very dangerous attack is the Salto golden Rathian. She jumps up and pulls her tail upwards. This attack makes for extremely much damage with you and poison you also, why you always should keep a few antidotes ready. The Golden Rathian can make several Salto succession, so watch out very well that their evades all. You can also start the Salto directly from the air when it hovers over you, which is again very dangerous. Just as the silver Rathalos it would be advisable to take as many flash bombs as possible to fight with, because the golden Rathian also very often staying in the air. Throw so often you can flash a bomb before the face of the monster if it is in the air so that it falls to the ground and you can attack it undisturbed.